The company was incorporated in Sydney, Australia in 2007 by a team of financial professionals who aimed to bridge the gap between retail and institutional clients offering trading solutions. Recently, the broker grows to one of the leading trading providers in Australia and further, serves a Chinese Support centre and proposes truly competitive trading conditions. The markets offer includes a range that suite demands of any trader and include the major instruments to trade, along with new additions alike Cryptocurrencies. The asset classes consist of FX, Equities, Commodities, Futures, Stocks and Bonds. The IC Markets Crypto trade offers trading pairs with Bitcoin, Ethereum, Dash, Litecoin, Bitcoin Cash and Ripple, and allows go long or short with leverage 1:5 margin of 20% and the minimum lot of 0.01. IC Markets is an ECN trading environment provider that brings true spreads from 0.0 pips from the liquidity suppliers from over 50 different banks and dark pool liquidity sources across 60 forex pairs. IC Markets is a choice for high volume traders, scalpers, EA traders and robots that can enjoy no dealing desk with no manipulation at the prices. The execution brings speeds and low latency through fiber optic connects traders orders to the market by servers in the NY4 & LD5 IBX Equinix Data Center New York and London. IC Markets strives to offer not only the best technological solutions but understanding the necessity of good quality customer service and support. Their team has a significant amount of experience within the forex industry, hence understands what traders want and need exactly. Educational materials provided on a free basis and allows to obtain a clear vision of the topic through regular technical analysis reports, video tutorials, informational tools and more. Is IC Markets safe or a scam? IC Markets considered being a safe broker, as the licensed and regulated trading companies are constantly overseen and audited by the external reputable authority. In the case of IC Markets, as the broker is incorporated in Australia it does its service regarded by the Australian Securities and Investments Commission (ASIC) license (read more why trade with ASIC Brokers). Therefore, with a license and regulation from ASIC, which one of the strictest and most demanding financial regulators, IC Market traders can feel completely confident. The money protection provided through multiple regulated ways and includes the client money segregation while accounts accessed by the client only and used for the purpose of facilitating own trading. In addition, IC Markets is a member of the Financial Ombudsman Service (FOS), an approved Australian external dispute resolution scheme that fairly and independently resolves disputes between consumers and member financial services providers. Apart from the sophisticated technical optimization of the execution provided by leading technologies, the IC Markets offers advanced software proposals too. MetaTrader 4 and cTrader are two of the best trading platforms available in the market today, hence IC Markets have both options in their direct access to provided ECN trading environment. Nevertheless, you can still trade through MetaTrader5 an updated and improved version that is packed with brand new features if you prefer so. There is no need to talk long about the platform’s features, as all and each of them delivers powerful trading features. Auto trading compatible with all broker’s platforms, EAs at MT4 or MT5 myfxbook at cTrader platform and as an addition, ZuluTrade is available too. ZuluTrade is one of the best social trading platforms that allow to choose among thousands of talented traders and to follow their trading signals for free. Moreover, if you are willing to go into the partnership with the broker there is an offer by MAM and PAMM multi-account management systems that are flexible and easy to use tools. FIX API delivers great opportunity for high volume traders, while VPS (Virtual Private Server) allows to run a variety of automated trading strategies with a possibility to get free VPS use (if a required minimum volume of 15 round turn (FX) lots per calendar month is reached). Overall, IC Markets truly brings trading into the next level by comprehensive tools, additions and extensions to the platforms such as a one click trade module, market depth, spread monitor, trade risk calculator and advanced order types previously not available on MetaTrader 4. There are three main account types that are featuring the same compatibility and power provided by the company, yet are designed to meet the expectations and needs of different trading styles. The accounts are available in multiple currencies, up to 10, are fully segregated from the company’s funds and supported by multi-lingual customer team. The traders that follow Sharia rules can sign for Swap free or Islamic account as an option at IC Markets too, along with risk-free demo account on both MT4 and cTrader that allows practice of the trading strategy. So now let’s check on a difference between the trading fees on applicable accounts, as the fees slightly diverse. 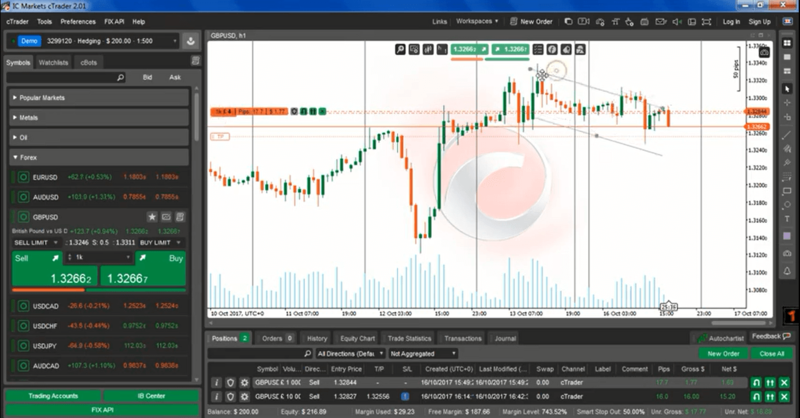 The Standard Account enabled through MetaTrader4 with CNS VPS Cross-Connect and spread only basis from 1.0 pips. The True ECN account allows micro lot trading from 0.01 size, deep institutional grade liquidity, ECN spreads from 0 pips and commission of 3.50$ per 100k traded available at MT4 also. Spreads on EURUSD averages at about 0.1 pips 24/5, which is as per the IC Markets expert advisors is currently the tightest average EURUSD spread globally. cTrader ECN account offering approximately the same feature as MT4, but with the difference of the platform that is used by mainly professional traders of bigger size. The applicable spread also starts at 0.0 pips and commission of 3.00$ per 100k traded that serves execution though Equinix LD5. For instance, compare fees to AvaTrade. IC Markets overnight fee or a swap rate determined by the overnight interest rate differential between the two currencies involved in the pair and whether the position is a buy ‘long’ or sell ‘short’. The fee originally varies from the currency to another, but you should always bare in mind its existence that may bring you either negative or a plus to your account. IC Markets offering leverage up to 1:500 that opens the path to the forex market for Retail traders with quite low or small initial deposit to cover margins. The use of leverage can magnify gains but you should always remember that losses can also exceed your initial deposit. As leverage is known as a loan given by the broker to the trader to enable trading with a bigger capital and increase potential gains. However, we would recommend to any trader use tool smartly and read carefully how to set up correct leverage to a particular instrument or trading strategy. IC Markets offers 10 flexible funding options in 10 major base currencies AUD, GBP, JPY, HKD, SGD, NZD, CHF, CAD, EUR, USD. From the client secure area, there is an ability to deposit or withdraw funds throughout Cards, PayPal, Bank Transfer including local ones, Neteller, Skrill, WebMoney, Qiwi, China UnionPay, FasaPay and more. The Standard Account enabled through MetaTrader4, along with other two account types available at IC Markets are set with the minimum deposit of 200$ to start. IC Markets does not charge additional fees for deposits or apply 0$ fee for withdrawals. Yet, for International Bank Wire withdrawals, IC Markets pass the transfer fees charged by the company banking institution, which is approximately AUD20 that is deducted from the amount of your withdrawal. However, make sure at your payment provider about transaction fees that may incur on payments to and from some international banking institutions. As a general impression, the IC Markets brought a truly advanced trading offering, while you are able to choose from a wide range to tailor almost any trading parameter, which instrument to trade, a platform to use, account to open, to use auto trading or social trading, or even become a partner. Indeed, IC Markets technical optimization is among the strongest in terms of execution, platform optimization, the range of tools and provided support. Along with true ECN and very competitive price strategy based on spread only or with lowest spreads but commission per trade, the broker delivers widen a range of markets to choose from, as well as a strong offering of Cryptocurrency. All that available and fully customized with the IC Markets broker.